"One of America’s most important novelists" (New York Times), the award-winning, New York Times bestselling author of The History of Love, conjures an achingly beautiful and breathtakingly original novel about personal transformation that interweaves the stories of two disparate individuals—an older lawyer and a young novelist—whose transcendental search leads them to the same Israeli desert. Jules Epstein, a man whose drive, avidity, and outsized personality have, for sixty-eight years, been a force to be reckoned with, is undergoing a metamorphosis. In the wake of his parents’ deaths, his divorce from his wife of more than thirty years, and his retirement from the New York legal firm where he was a partner, he’s felt an irresistible need to give away his possessions, alarming his children and perplexing the executor of his estate. With the last of his wealth, he travels to Israel, with a nebulous plan to do something to honor his parents. In Tel Aviv, he is sidetracked by a charismatic American rabbi planning a reunion for the descendants of King David who insists that Epstein is part of that storied dynastic line. He also meets the rabbi’s beautiful daughter who convinces Epstein to become involved in her own project—a film about the life of David being shot in the desert—with life-changing consequences. But Epstein isn’t the only seeker embarking on a metaphysical journey that dissolves his sense of self, place, and history. Leaving her family in Brooklyn, a young, well-known novelist arrives at the Tel Aviv Hilton where she has stayed every year since birth. Troubled by writer’s block and a failing marriage, she hopes that the hotel can unlock a dimension of reality—and her own perception of life—that has been closed off to her. But when she meets a retired literature professor who proposes a project she can’t turn down, she’s drawn into a mystery that alters her life in ways she could never have imagined. Bursting with life and humor, Forest Dark is a profound, mesmerizing novel of metamorphosis and self-realization—of looking beyond all that is visible towards the infinite. 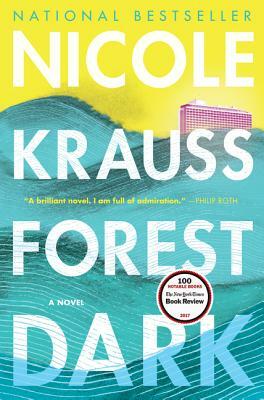 Nicole Krauss is the internationally bestselling author of three novels: Man Walks Into a Room, a finalist for the Los Angeles Times Book of the Year; The History of Love, a New York Times bestseller and winner of the Saroyan Prize for International Literature; and Great House, a New York Times bestseller and finalist for the National Book Award. In 2007 she was selected as one of Granta's Best Young American Novelists, and in 2010 she was chosen for the New Yorker’s ‘Twenty Under Forty’ list. Her fiction has been published in the New Yorker, Harper's, Esquire and Best American Short Stories, and her books have been translated into more than thirty-five languages. Nicole Krauss lives in New York.